Laughing Buddha is closely associated with Lord Kuber or Kubera in Hinduism. Many Hindus keep laughing Buddha in home to overcome various vastu doshas. One of the important images of laughing Buddha is of him on a boat. Here are the benefits of Laughing Buddha on boat. This particular form of laughing Buddha is associated with career and job. It is associated with wealth and prosperity. 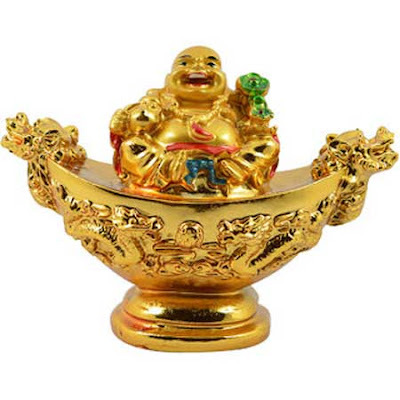 Keeping laughing Buddha with boat on office table or working table in home will help in achieve success in career. This will help in getting the desired job. It helps in achieving professional success. All difficulties in getting job and progress in career will be solved by having laughing Buddha with boat. The boat should be placed in such a way that it is coming inside.